Well. It's been a while, hasn't it. Much to my surprise, life after graduate school does not, in fact, automatically come with more free time. On the contrary, along with my shiny new job came a shiny new commute, and part of me feels a perverse longing for the "free" time I had a year ago. Finding the time and energy to cook dinner with any kind of regularity has been a challenge, let alone finding the motivation to photograph and write about what I manage to cook. Recently, though, I've enjoyed some extra inspiration to make time for baking. Summer fruit hit its stride a few weeks ago, just in time for Amy I. to return to the Bay Area. Now, when a friend arrives back in town after six months abroad, when she and her spouse move into their new place, housewarming goodies must be baked. And baked they were. I could think of no more delightful way to celebrate their return than with an abundance of summer's best in one of my favorite fruit desserts: a frangipane tart. You see, I am a sucker for many things nut-related, but perhaps most of all for frangipane. So simple, so easy, frangipane feels disproportionately (almost guiltily) rewarding for how little work goes into it. A food processor makes quick work of the filling, and whether you scatter the fruit haphazardly or arrange it artfully, the result rarely fails to take on a kind of elegance. In the end, for reasons I can't quite identify, frangipane tarts feel at once rustic and refined, the sort of dessert that feels equally at home eaten off of a napkin or china plates. This is a choose-your-own-adventure sort of dessert, one that works with a variety of crusts and virtually any fruit you can imagine pairing with nuts. I think that stone fruits make the best frangipane tarts, but pear and apple also shine in this setting (pear frangipane tarts are a classic French dessert), and I will probably try a fig and frangipane tart before the summer's out. 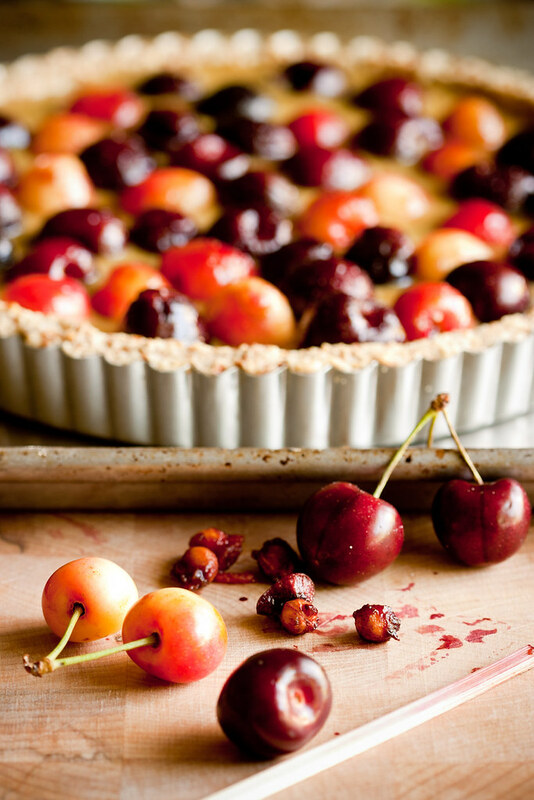 For this tart, however, the timing couldn't have been better for cherries. 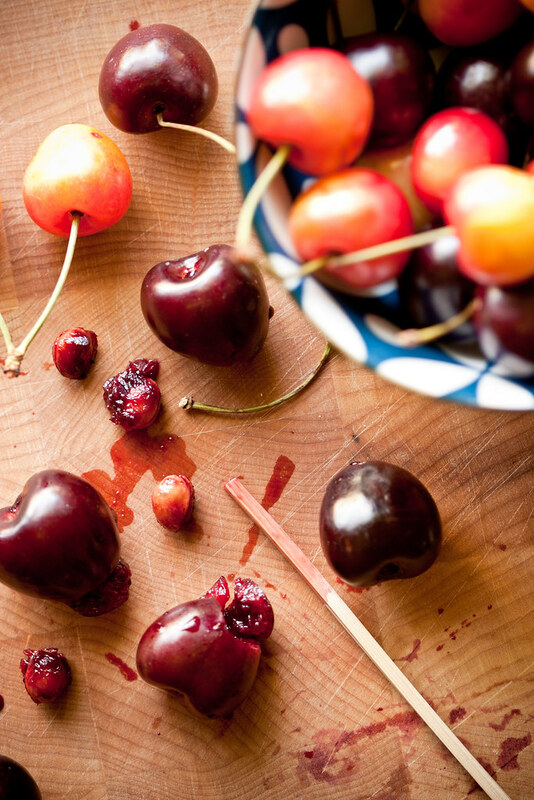 Sweet and succulent, and just hitting their peak, cherries have had me on a veritable baking streak. They seem particularly fine this year, despite (or perhaps thanks to?) 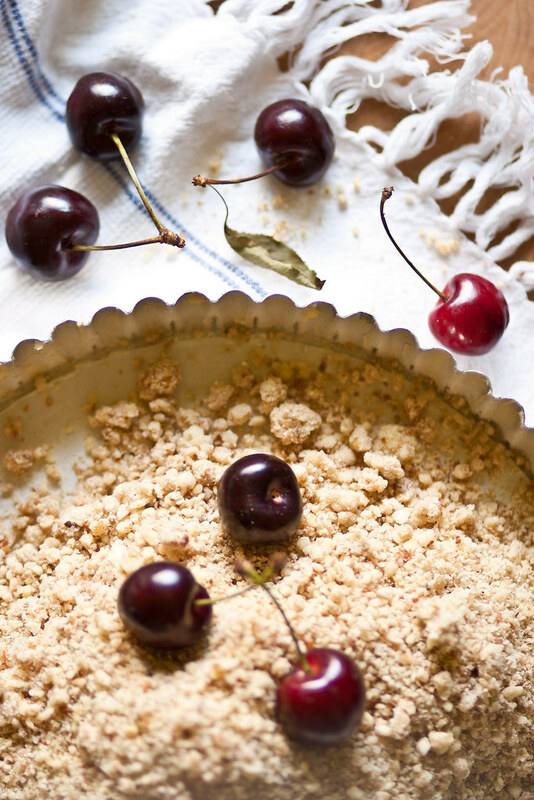 an unusually rainy and cool spring, and I am enjoying cherries like never before: packed in lunches, at picnics in the park with puppy, out of hand as I putter about the house, and of course baked in tarts like this one. I do hope you'll give it a try. Adapted from Deborah Madison's Seasonal Fruit Desserts. Makes one 9-inch round tart, plus enough frangipane for another tart. Combine the first four ingredients in the bowl of a food processor and process until the nuts are finely ground. Add the butter in pieces and process until the mixture is smooth. Add the egg, yolks, almond extract, and liqueur (if using), and process until well blended. Divide into two equal portions, and refrigerate one half for later use. You may refrigerate the other half if not using right away; bring the mixture to room temperature before spreading into the prepared crust (see note). 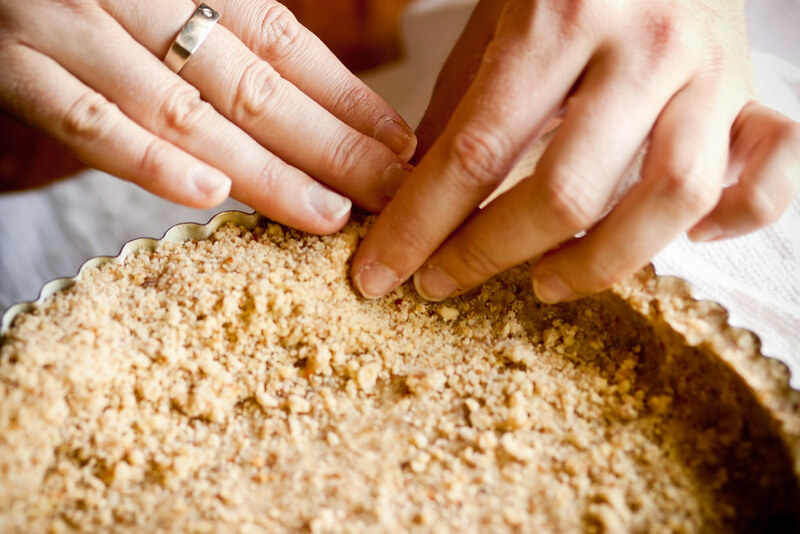 When ready to bake the tart, place a rack in the center of your oven and preheat the oven to 400F (200C). While the oven is coming up to temperature, heat the preserves, strain them, and stir together with 1 tablespoon water. Stem and pit the cherries, then toss with the sugar and strained preserves. 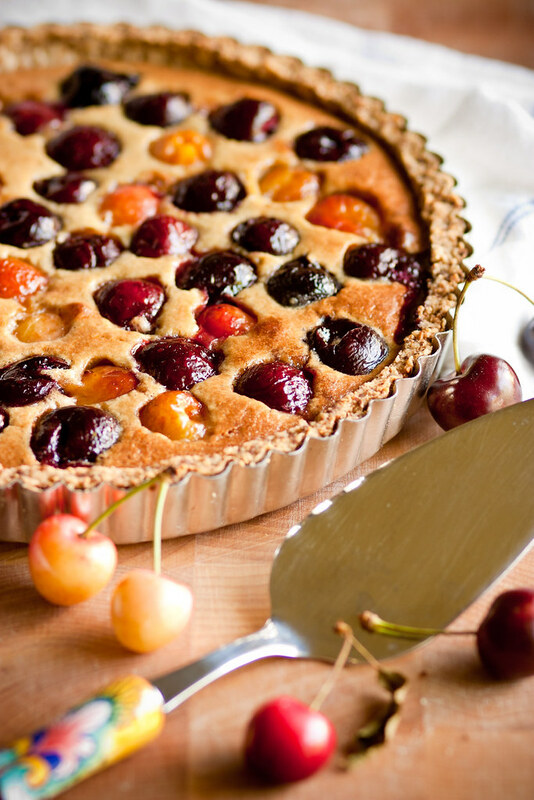 Spread the room-temperature frangipane over the cooled crust, and distribute the cherries over the top. Bake until the frangipane is puffed and golden, and the fruit has softened, about 35 minutes. You can also use white sugar, but I like the extra depth of flavor that raw or other kinds of unrefined sugar (such as sucanat) lend to the filling. The exception is the cherry mixture, where the fine grains of ordinary granulated sugar lend themselves to more even distribution. Kirsch works beautifully for a cherry tart, but you can also use Amaretto, especially if you're using a different fruit. This recipe makes twice as much frangipane as you need for one tart, but the mixture keeps, refrigerated in a clean container, for approximately one week. I find it a very handy thing to have around in case you need to make a dessert on short notice, and in summer I'm rarely without a jar of it in the fridge. You can also make frangipane using almond paste, which contains more finely ground almonds, but I prefer the texture of frangipane made with ground almonds. An example of almond paste frangipane can be found here. Welcome back! 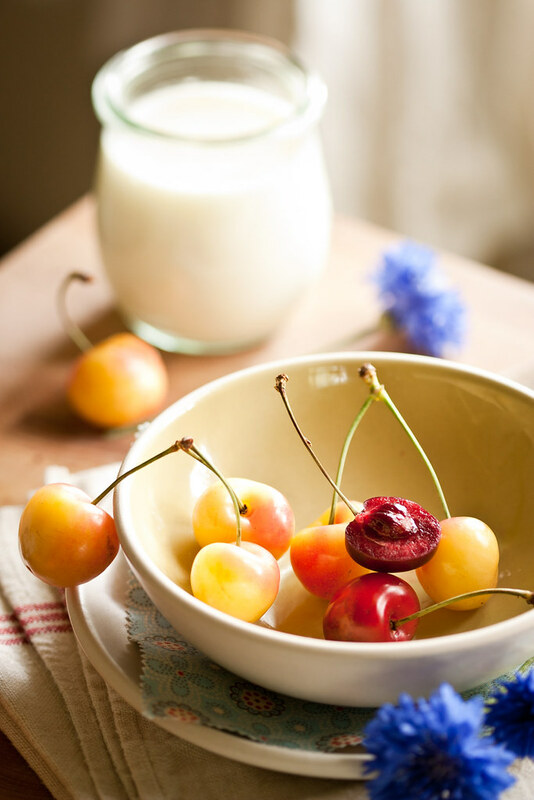 I am jealous of those cherries...I wish they had a longer season (so I can enjoy them when I return to the States in mid-August)! Thanks, Sapna! Sadly, most of the cherry vendors at Sunday's market said it was their last weekend for cherries... but maybe there will be some holdouts! Fingers crossed for you. Ahhhh!! I was so happy to see this post pop up in my Google reader for so many reasons. Those photos are stunning, and the tart tasted even stunninger. I know that's not a word but I'm using it anyways. LOVE!!! You are back!!!!!!!!! ***HUGE*** grins!!!!! And the cherries were lovely too.